METANOR RESOURCES COM NPV (OTCMKTS:MEAOF) recently announced that a shareholder has made a significant acquisition of shares in the company. The stock price has turned around after registering a record low never seen before at MEAOF and gained over 12% on Friday and gained over 300% since the beginning of the year. Volume has been relatively consistent over the last few weeks but surging to near record levels on a weekly basis. A recent development on the MEAOF has sent shares flying. The first is the turnaround in the overall sector and industry of mining and exploration companies due to the rise in gold prices. Once unprofitable projects are now becoming profitable due to the increase in gold bullion prices. 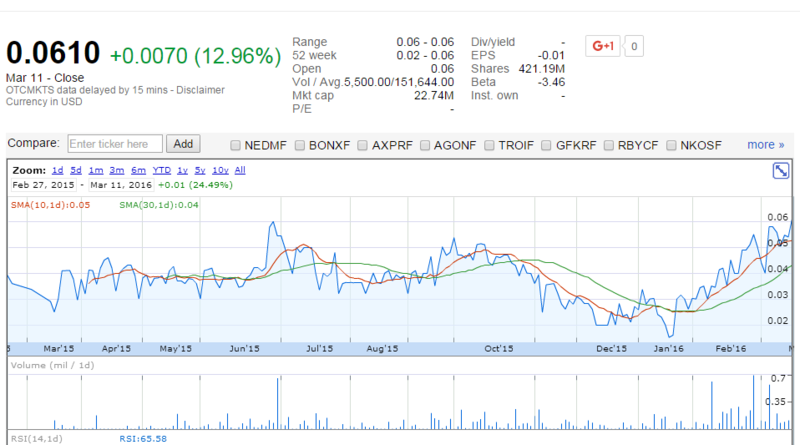 This has sent the shares skyrocketing over 300% since the first of the year. The second exciting development is the announcement that an investor has made a significant acquisition of securities in MEAOF. Eric Sprott who has long term focus in terms of his investment strategy. Eric Sprott acquired over 7 million shares of common stock which represents 1.7% of the total current outstanding share count. This is a huge vote of confidence by an investors given the fact that the average share price was at the current levels of CAD$0.063 and the share price as of Friday was CAD$ $0.07. Eric owners 30 million shares accounting for over 7.1% of shares outstanding and has warrants on common stock equivalent to 20 million shares. This makes for a total of 50 million common shares of exercisable and non-warrants equivalent to 11.3% of outstanding shares on a partially diluted basis. This means that Sprott currently has roughly over $2 million at stake in this microcap company. MEAOF has over 429 million shares outstanding and negative earnings. The share price hit a historical record 52-week low of $0.02 and has now appreciated in value significantly reaching a new 52-week high of $0.061. Over 1.1 million shares were traded this week on the stock which far exceeds the average weekly volume of 0.5 million. MEAOF is currently trading at a $22.47 million market valuation. Given the recent developments of a large shareholder acquiring more than 7 million shares upping his bets on the company, investors have reason to be excited about this microcap story. This is just the beginning of this story and there will likely be more developments forthcoming. Sprott has a significant stake in the company and will likely see that it is profitable. We will be updating on MEAOF when more details emerge so make sure you are subscribed to Microcapspot so you know what’s going on with MEAOF. Disclosure: we hold no position in MEAOF either long or short and we have not been compensated for this article.